Student Tours to Washington, D.C.
Washington, D.C., the Capital City of The United States and the seat of three branches of federal government, hosts a collection of monuments, memorials, and public museums unparalleled in size and scope throughout the history of mankind, and the lion's share of the nation's most treasured artifacts. The vistas on the National Mall between the Capitol, Washington Monument, White House, and Lincoln Memorial are famous throughout the world as icons of the world's wealthiest and most powerful nation. 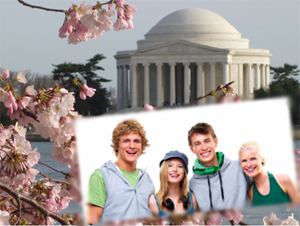 Spectacular parks, grand avenues, Smithsonian tours, and renowned attractions make Washington one of the most beautiful cities in the world. A city rich in history, culture, and adventure, Washington, D.C. is a destination of choice for thousands of student travelers each year. Washington, D.C. has many more attractions available for touring.